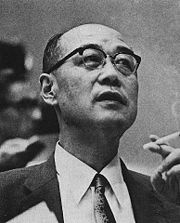 Hideki Yukawa FRSE (湯川 秀樹, January 23, 1907 – September 8, 1981) was a Japanese theoretical physicist and the first Japanese person to win the Nobel prize. His theory of mesons was the first clear depiction on how physical force takes place. A proton and a neutron engage in a give and take action of a pion, which generates a nuclear force. The proton] and neutron switch their positions every time they exchange a pion, strengthening their bond (stabilizing their energy state). He was born in Tokyo, on January 23, 1907. In 1929, after receiving his degree from Kyoto Imperial University he stayed on as a lecturer for four years. After graduation, he was interested in theoretical physics, particularly in the theory of elementary particles. In 1932, he married Sumiko and had two sons, Harumi and Takaaki. In 1933, he became a professor and an assistant professor at Osaka University at age 26. In 1935, he published his theory of mesons, which explained the interaction between protons and neutrons, and was a major influence on research into elementary particles. In 1940, he became a professor in Kyoto University. He also won the Imperial Prize of the Japan Academy that year. In 1943, he received the Decoration of Cultural Merit from the Japanese government. He became a professor at Columbia University in 1949. There, he won the Nobel prize for physics (1949), after the discovery by Cecil Powell of Yukawa's predicted pion in 1947. Yukawa also predicted K-capture, in which a low energy hydrogen electron could be absorbed by the nucleus. In 1953, he became the first chairman at the Yukawa Institute for Theoretical Physics . An honorary doctorate from the University of Paris and honorary memberships in the Royal Society of Edinburgh, the Indian Academy of Sciences, the International Academy of Philosophy and Sciences, and the Pontificia Academia Scientiarum were all granted to him for his contributions to science. He had been an editor at Progress of Theoretical Physics since 1946. He had published many scientific papers and lecture notes, including “Introduction to Quantum Mechanics” (1946) and “Introduction to the Theory of Elementary Particles” (1948), both in Japanese. In 1955, he joined 10 other leading scientists and intellectuals in signing the Russell-Einstein Manifesto, calling for nuclear disarmament. He died on September 8, 1981, at age 74. His name remains visible in the quantum field theory. Written in a non-relativistic form, the potential energy of the force is called the Yukawa potential. In the general terms of quantum field theory, the Lagrangian describing the pion-nucleon interaction is called the Yukawa interaction. This page was last modified on 24 December 2017, at 20:10.